A half hour north of San Diego and an hour South of Palm Springs is a little slice of Napa in Southern California. The Temecula Valley Wine Country is relatively small- about 22 wineries total- but this friendly wine region is welcoming to inexperienced tasters and veterans alike. Since the wineries tend to be smaller than some of the more commercialized ones elsewhere, you have a fairly good chance of ending up in a conversation with the winemaker or the owner of the winery while tasting. Like most of the wine growing regions, Temecula hosts special events and festivals throughout the year such as the Winter Barrel Tasting every January, Summer Jazz Concert series, and the Harvest Wine Celebration that takes place in November, but any day is a good day to visit, enjoy the beautiful scenery, and taste some terrific wine. Most tasting rooms offer a menu of tasting choices that include both red and white wines and, in some cases, sparkling or dessert wines, too. Five to Ten dollars usually buys about five tastes and a souvenir wine glass. If you don’t feel like designating a driver, consider using the Grapeline Shuttle, which transports tasters between the different wineries. Your first stop should be Wilson Creek Winery at the far end of the valley. Wilson Creek has beautiful grounds, and are best known for their almond champagne. It is absolutely out of this world – no wonder they call it the “Oh My Gosh” champagne. Falkner, another great winery, offers a nice selection of reds and whites, a fabulous view, a stellar photo opportunity from their front porch, and a great gift shop. 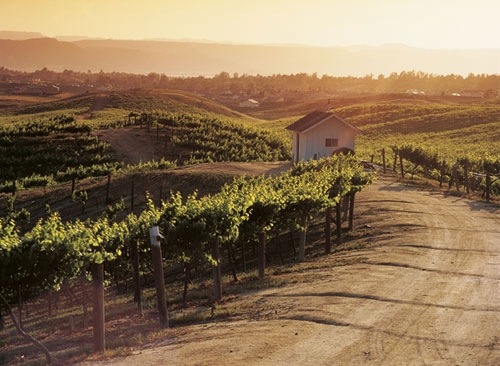 With a beautiful tasting room and a wide range of wines, Callaway Vineyard and Winery is a terrific stop – especially since you may be able to find some of their wines in stores outside of Temecula, which isn’t true of some of the smaller wineries. beautiful, and on a warm day fills up quickly, so be prepared for a wait if you arrive during the peak lunch hours. Baily’s is also a great place to taste wines – maybe while you’re waiting for a table to open up at the restaurant. If you enjoy red wine, make sure to stop at Hart, the first winery you’ll pass as you enter the Valley. Hart’s outside is unpretentious, but its wines are outstanding. 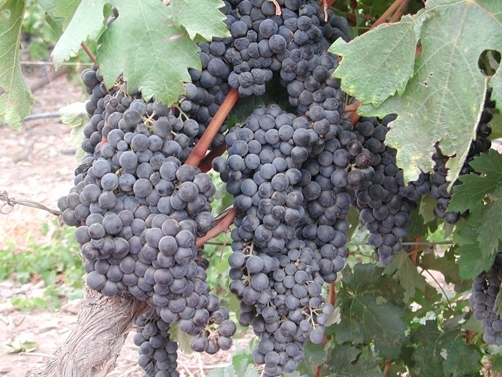 Hart offers several less common varietals of red wine, including Barbera, Tempranillo, and Aleatico. The last stop of the day should be at Miramonte Winery. They specialize mostly in red wines, which are excellent, and also make some exceptional sparkling wines. They host wonderful low-key early evening events such as Flamenco Fridays and Saturday Blues Jams, where you can listen to music, drink wine, and enjoy a light meal. If you’re looking to spread your tastings over more than one day, you can’t go wrong with a night at the Loma Vista Bed and Breakfast, in the hills above Baily’s Winery. The rooms are beautiful, reasonably priced and include a delicious breakfast. After a day of tasting Temecula Valley wine, there is no better end than relaxing in the Loma Vista hot tub at sunset, taking in the view of the valley while enjoying a glass of your favorite vino. Now that’s the perfect final touch to this memorable trip.